​​​ EL PASO - The El Paso Borderplex economy continued to expand during third quarter 2015, according to Cushman & Wakefield's Third Quarter 2015 Marketbeat. Employment is still climbing upward boosting the region’s business-cycle index. The region’s unemployment rate has dropped since this time last year and remains low at 5.3 percent. 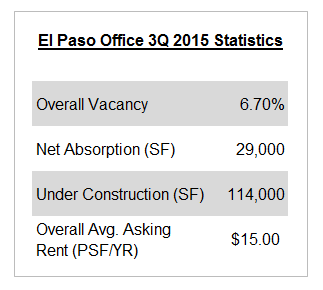 El Paso’s office market recorded a decline in vacancy and net absorption while rents increased. The overall office vacancy rate measured 6.7 percent as of 3Q 2015, a drop from 7.3 percent reported in 2Q 2015. The El Paso office market has experienced a maturation. With virtually no new construction in the past half dozen years and the introduction of some exciting iconic office redevelopments in the same timeframe, it is expected that new Class A buildings will soon emerge. In the CBD alone, the inventory is expected to increase by over 4 percent in the next 18 months. Medical Office Buildings represent the next major segment of the market and will impact the inventory with Class A space accounting for upwards of 2 percent citywide. ​Don't miss out! See El Paso Market Research.